Miriam Mehadipur arrived in Israel from Holland, where she was a student at the Royal Academy of Art. Her immigration to Israel and her decision to settle in Tzfat was influenced in part by, as she says, "the wonderful bright light of Israel" after the "soft light and little sunshine of Holland." Her marriage to Menachem Mehadipur was, of course, another compelling reason for coming to Tzfat, but it has been Tzfat's beauty and its open light and welcoming ambiance which has most influenced and impacted her decision to live and work in Tzfat during last decade, and her gallery in Tzfat's Artist Quarter has flourished during this time. Miriam's artistic style has been heavily influence by the traditional Persian art of her husband Menachem's family and culture. Her subject matter is often Jewish-inspired, and as she notes, her usage of colors is expansive and free, in keeping with the mood of openness and brightness that she has come to feel in Tzfat. Miriam often explores different aspects of women in her paintings. She has painted female figures from the Bible and strives to portray their serenity and calmness in order to allow the viewer a glimpse at her vision of their inner beauty and strength. Themes of birth and rebirth reoccur frequently in Miriam's works, and she often paints her central figure encased in a "seed pod", or perhaps a womb, as an expression of one's vision of the promise of the future and the potential for growth and happiness that are ever-present in every person's thoughts. Miriam's goal in her painting is to inspire the viewer to tap into their own world of beauty, peacefulness and joy as they gaze at her paintings. Her "Women of the Bible" series encompasses the Matriarchs Sarah, Rebecca and Rachel, as well as Ruth, Miriam and Queen Esther. 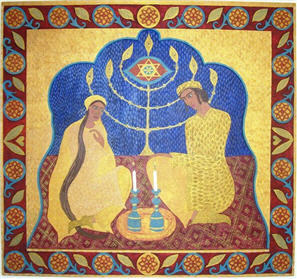 A number of Miriam's paintings are exquisitely framed by her husband, Menachem, who designs and carves the wooden frames. These frames then become an integral part of the painting. Some of these paintings include her Four Mothers Series (the Biblical Matriarchs), as well as Abraham and Sarah and others. Miriam likes to work with oil pastels and ink on paper, oils on canvas, and oils and acrylics on wood, and these mediums lend themselves well to the intricately carved frames that Menachem creates for them. Miriam's gallery is in the General Exhibition of the Artists Quarter. She can be reached at 972 4 6821732 or via email at [email protected] Check out Miriam's website.